Earlier this month we received a tip that VUDU, a popular HD movie streaming service, would soon be offered on the PlayStation 3, and now Sony and VUDU have made it official. Starting next week, PlayStation 3 users will have access to the service via a free downloadable app available on the PlayStation Store, after which they will be able to access it from their XMB. For those unfamiliar with VUDU, it is a pay-as-you-go HD streaming service with same day availability as DVDs and Blu-rays for many popular films. It is completely cloud-based, so users don't have to download files or endure lengthy buffering times, and is one of the few services to offer full 1080p HD films with Dolby Digital Plus 5.1 surround sound. Users can choose to rent or buy movies, with prices ranging from $1.99 to $19.99. Additionally, VUDU has announced an update to its core interface that will bring improvements to menu navigation and content discovery, including recommendations based on your viewing history. 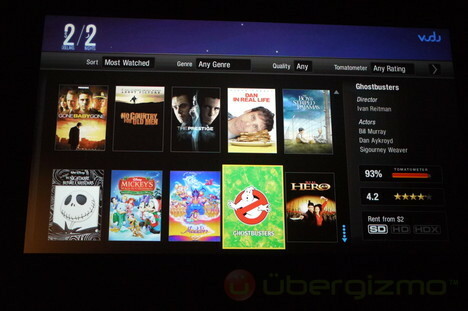 The VUDU 2.0 update will be released later this year. Is the U.S region only? NAH BRAH. BLU-RAY IS BETTER. MEGAlan wrote: NAH BRAH. BLU-RAY IS BETTER. Yes, this is only US.